Beautiful vintage repousse bangle bracelet with crisp Art Nouveau inspired floral work, circa 1960s. Bracelet has an oval shape and measures 2.3 inches by 2.2 inches on the inside diameters. It is 1/16 inches thick and 3/4 inches wide. Has a push in clasp which works perfectly and a safety chain. 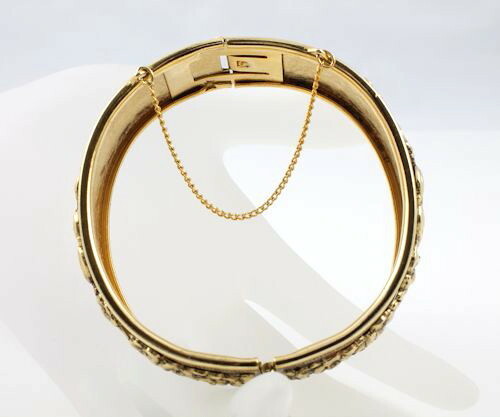 Great bangle in excellent vintage condition.